Jason Loeb and Nicole Chan played their first live escape game in Boston in January 2015. Six months later, they opened their own and called it Trapology. Live escape games, or “escape room” games, are trending across the country. Increasingly, groups of up to 10 people are paying to be locked in a room with the goal of finding their way out using clues, hidden objects, and puzzles. During escape games, puzzlemasters are seated in a control room, giving players hints when they’re needed. Chan is considered the head puzzlemaster at Trapology—she designs the challenges and puzzles for her games. Loeb helps implement and build them. After Loeb and Chan played their first escape game, they knew they were hooked. Since they’d played Boston’s only live escape game at the time, the boyfriend and girlfriend played escape games as often as they could while traveling, skillfully finding their way out of locked rooms in U.S. cities as well as ones in Europe and Asia. 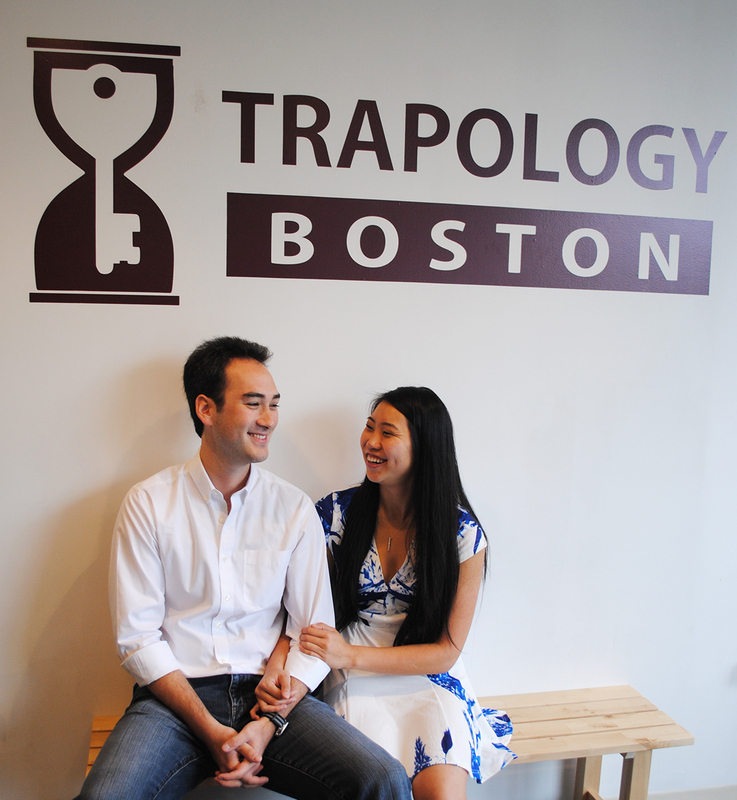 On one particularly long flight home, the idea for their new Boston escape game—Trapology—emerged. When the couple returned to Boston, they set out to conquer the hardest part of opening Trapology: finding a landlord who’d let them build a game, trap doors and all, in their space. “—She didn’t think we were going to make money!” asserts Chan. But the duo knows a thing or two about business. They’re Bentley grads with degrees in finance and accounting, and are alums of major consulting firms Deloitte and Ernst & Young. Their business acumen pulled through, landing them some prime real estate overlooking the Boston Common. Chan’s past experience has also helped in designing games—she uses Excel spreadsheets to organize her puzzles, with columns designated for difficulty levels, categories, and complexity to build. Spreadsheets aside, the couple met while in a theater group at Bentley, which Chan explains has given them experience in putting on a theatrical experience of sorts. “When we thought about if we could do this escape thing, we immediately thought back to all of the cool, elaborate two-story sets that we built for theater. We thought ‘Yeah, we can do this. This is a possibility,’” she says. While there’s another escape game in town, run by a company with multiple locations across the country, the couple says they don’t see it as competition. Trapology currently offers one escape game called “Drunk Tank,” which challenges players to find their way out of a jail cell after presumably being locked up because of a rowdy pub crawl. Loeb and Chan are working on their next game, in which some players, held hostage after gambling their life savings away, need to be rescued by other players. The couple hopes to have a total of three games open by the end of the year. Chan says the hardest part of the job is outsmarting Boston’s smarties. $28, tickets by reservation, 177 Tremont St., second floor, 857-285-2085, trapologyboston.com.